Argonne Clubhouse & Playground is a newly constructed park in the City of San Francisco. The park is located at 455 18th Avenue in the Richmond District. It features basketball and tennis courts, a toddler's play area with swings and sandbox, picnic, stage, and grassy areas, as well as a new clubhouse for indoor activities. 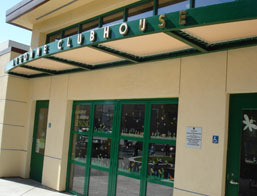 The clubhouse features bi-fold doors that open to the outdoors, weather permitting. Argonne Playground is a great addition to the community and will serve people of all ages. Talk about fun. This park does get crowded at times because it’s considered new. Argonne is also surrounded by other great places so you’ll never get bored. If you get hungry at Argonne Park then head over to Joe’s Ice Cream at the corner and head back to the park for some more fun. People of all ages, stop by this park to play, talk, or relax. With all its new features, there’s no reason not to go. There are many things one can do at Argonne Park. I personally like the new swings they added. They are big and round and could fit at least 4 people at once. Or if you lie down on one and swing, it feels slightly like flying. Still not convinced to go? There’s much more you can do. Plan a party there. There’s no reason for one to be bored here at Argonne Park. Also Argonne Park is usually filled with very nice people. So hang out and make some new friends. Argonne is the greatest!! !